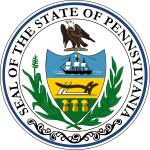 The 1905 United States Senate election in Pennsylvania was held on January 17, 1905. Incumbent Philander C. Knox was elected by the Pennsylvania State Assembly to his first full term in the United States Senate. ^ a b "U.S. Senate Election - 17 January 1905" (PDF). Wilkes University. Retrieved 24 December 2012. ^ "QUAY, Matthew Stanley, (1833–1904)". Biographical Directory of the United States Congress. Retrieved 24 December 2012. ^ "KNOX, Philander Chase, (1853–1921)". Biographical Directory of the United States Congress. Retrieved 24 December 2012. ^ "PA US Senate - 1905". OurCampaigns. Retrieved 22 December 2012. This page was last edited on 15 December 2018, at 23:07 (UTC).